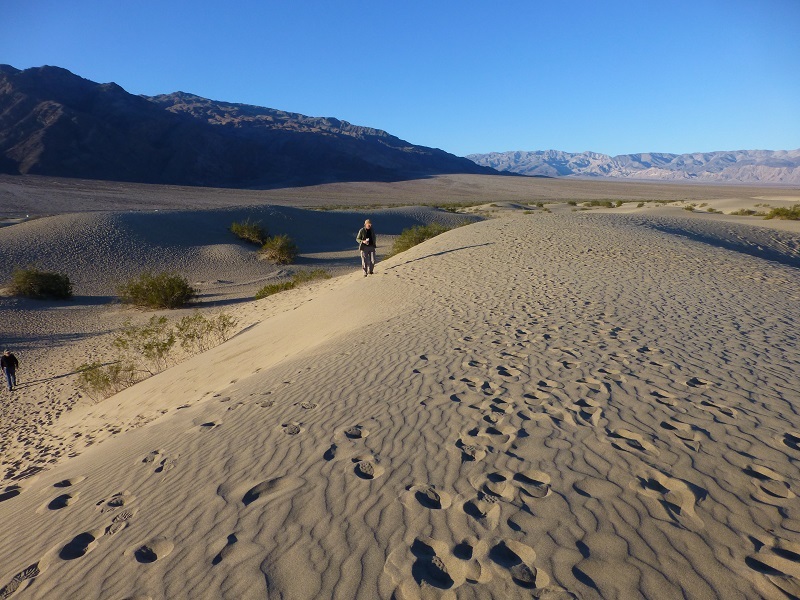 Last year we had visited Death Valley at this same time and were wowed by the “Superbloom.” We discovered zero wildflowers this year but there are always incredibly beautiful areas to explore in Death Valley and one of those are the Mesquite Flat Sand Dunes. 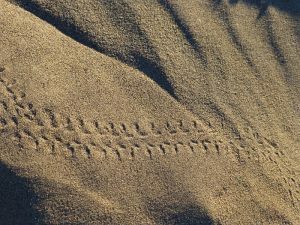 They are a beautiful place to visit in the morning when we could see the tracks that the nocturnal wildlife made. 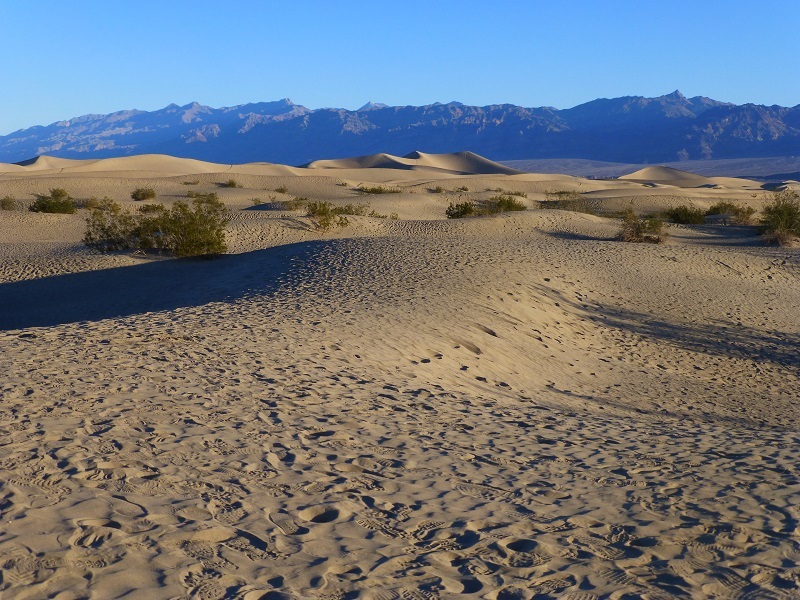 Just 1.9 miles east of Stovepipe Wells, the Mesquite Flat Sand Dunes lay on top of an ancient lake bed known as Mesquite Lake. 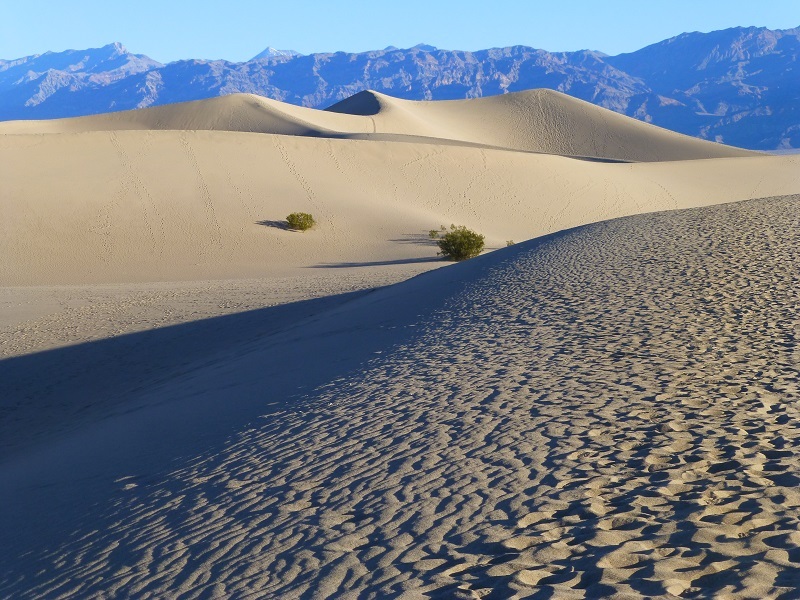 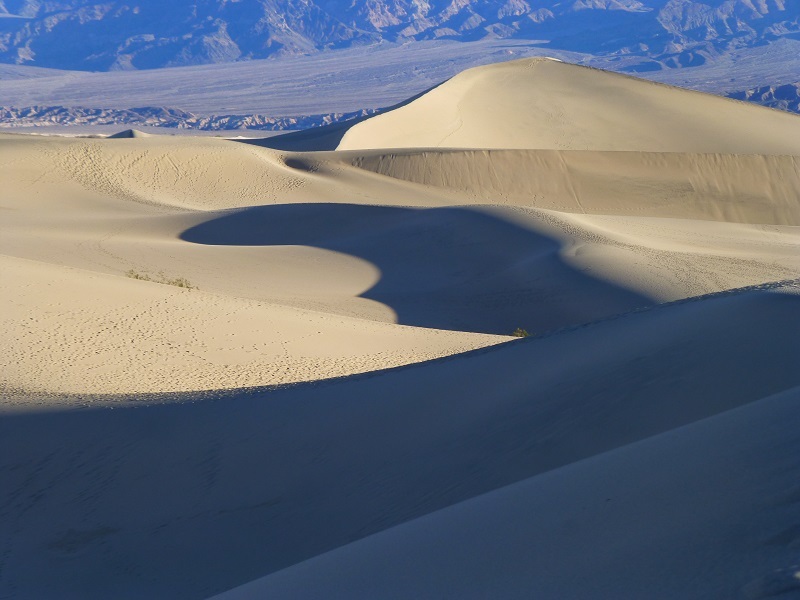 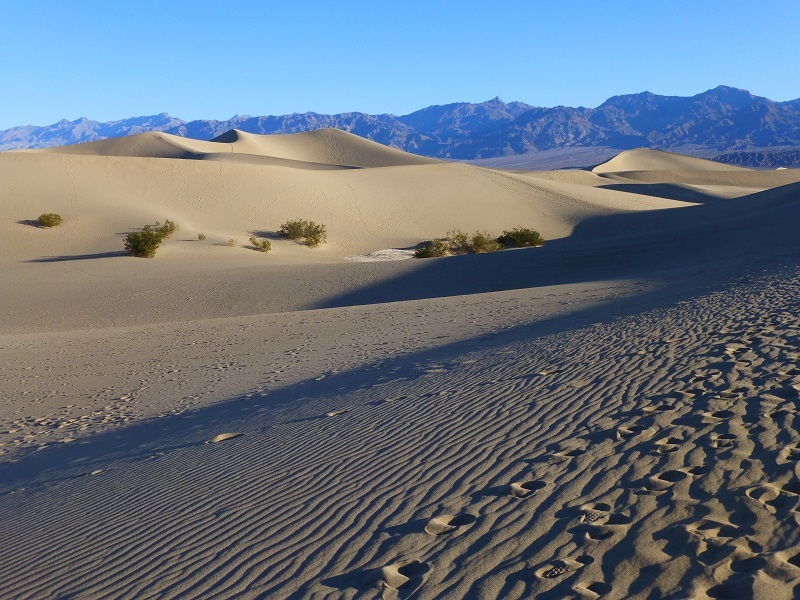 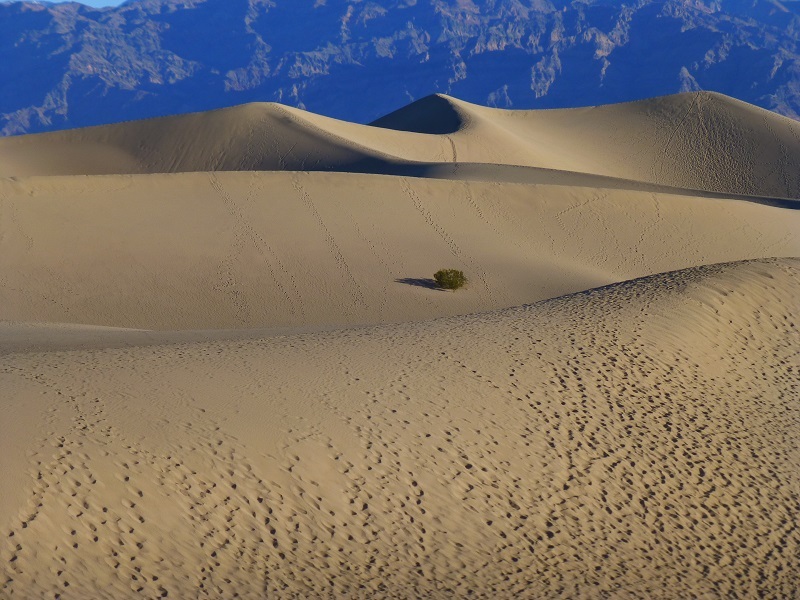 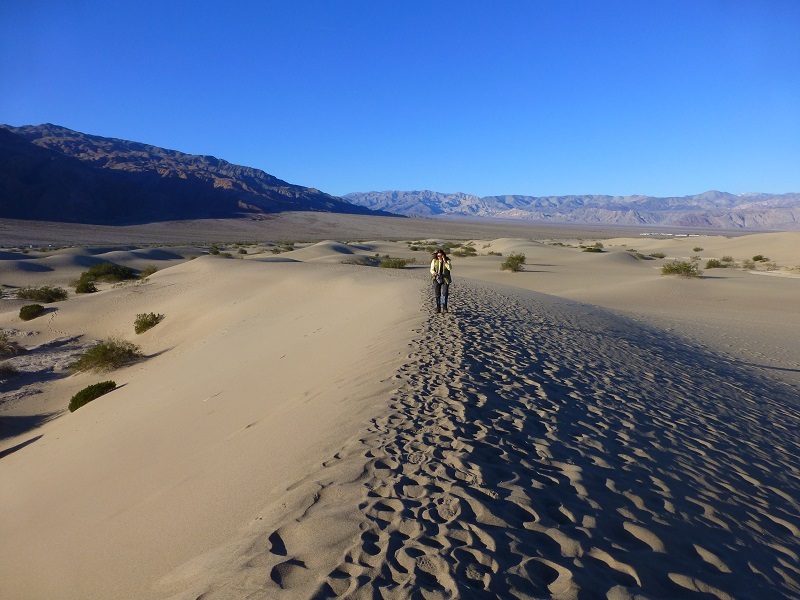 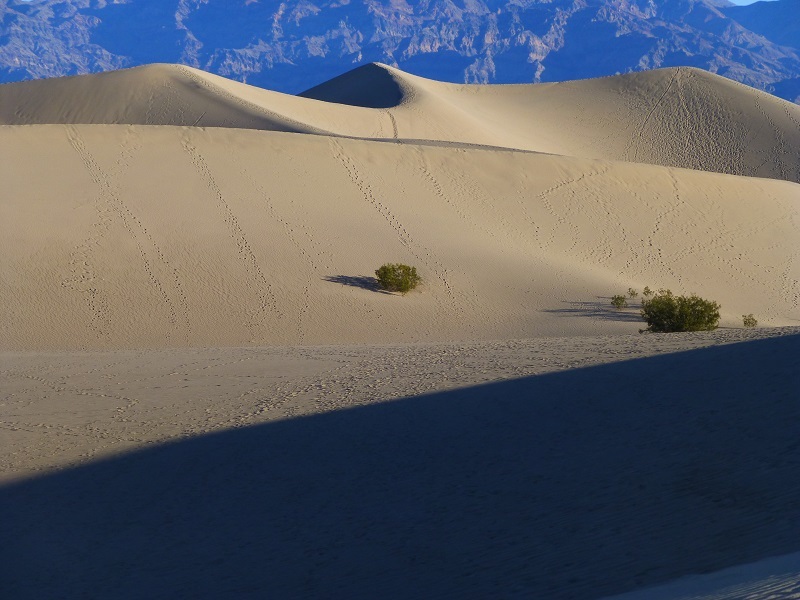 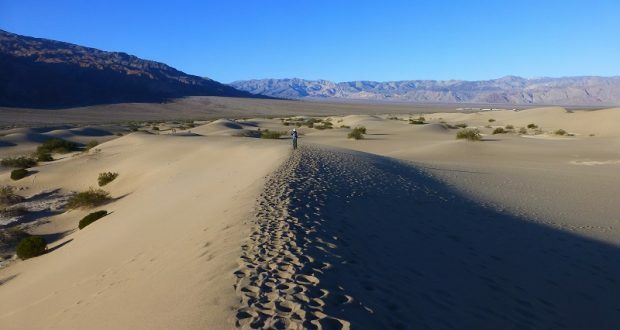 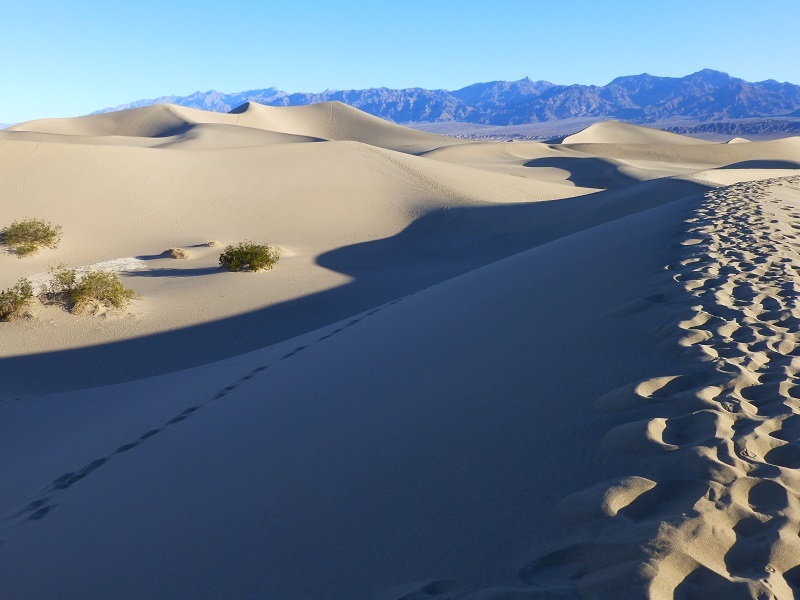 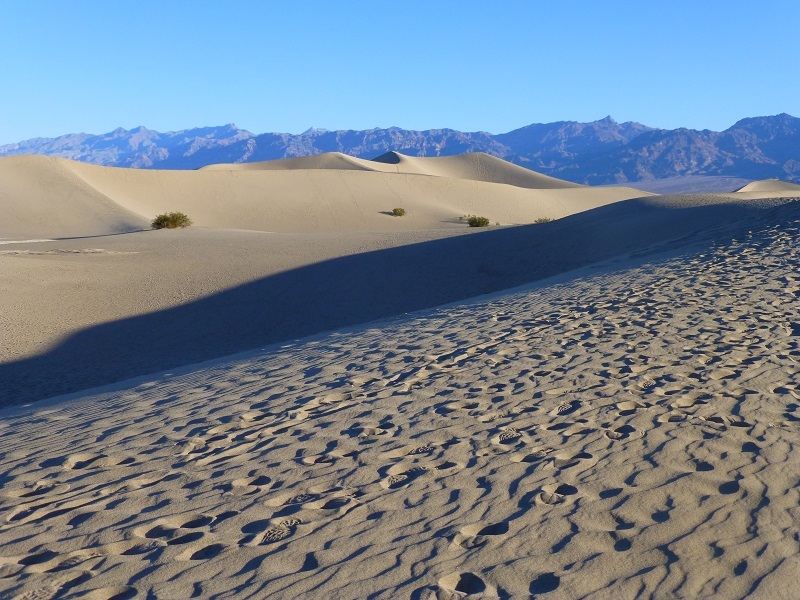 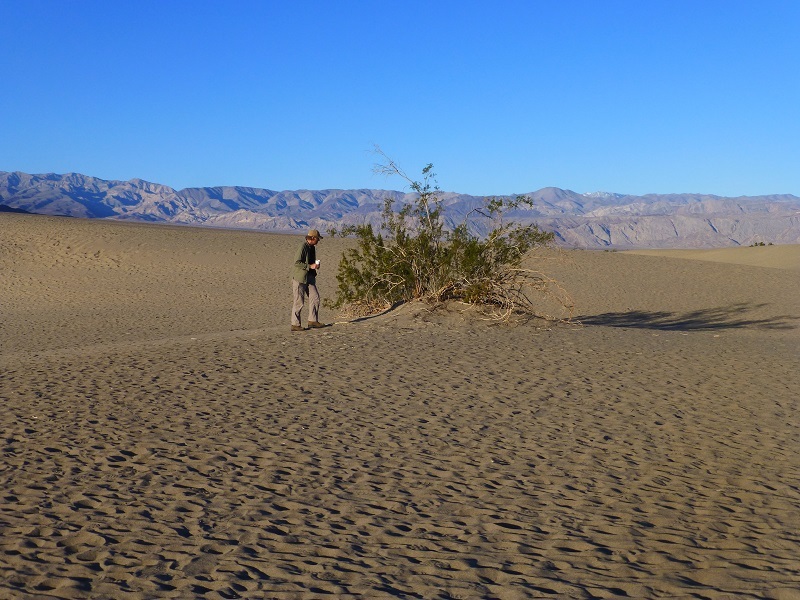 The dunes had been created by winds blowing in small particles of material that included quartz, believed to have come from Marble Canyon and the Panamint Valley. 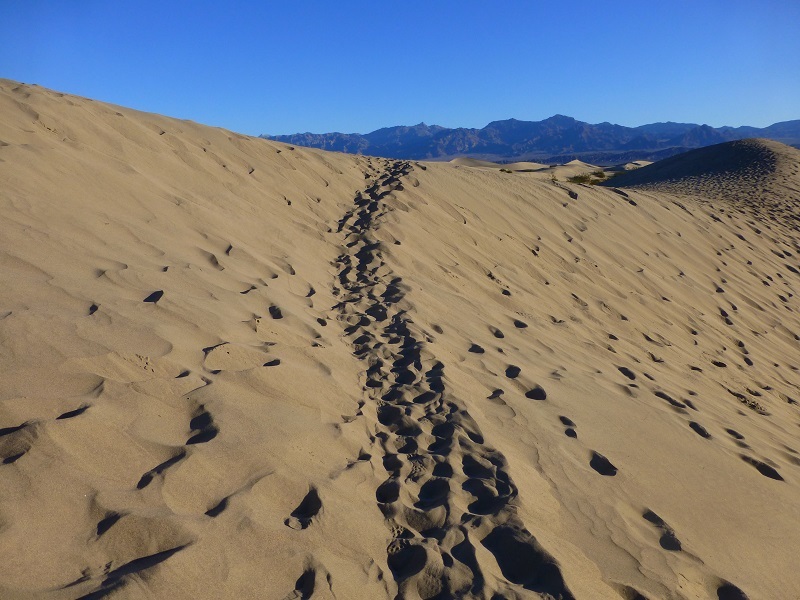 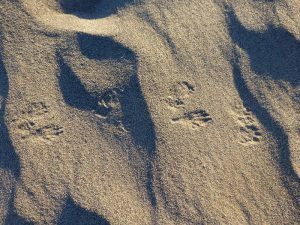 We heard that many of the animal tracks could be located near the mesquite and other sparse vegetation in the dunes so that is where we started our searching. 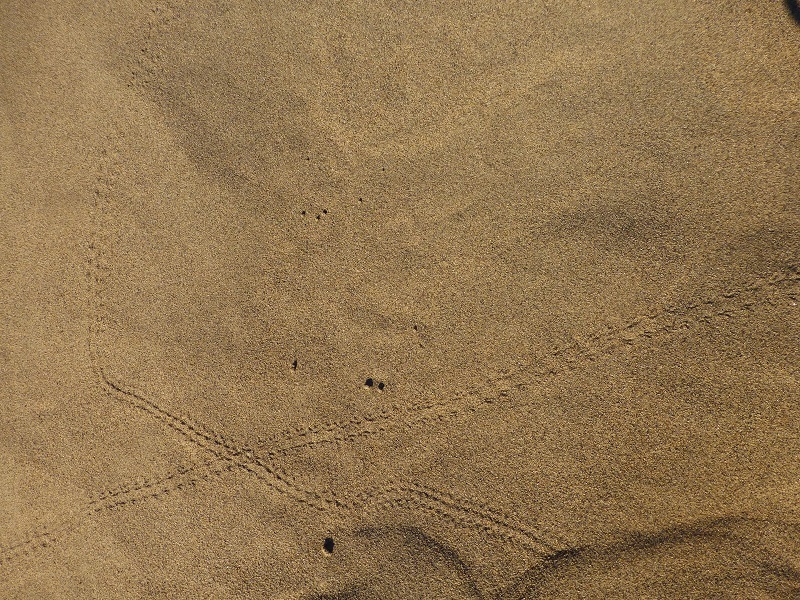 It didn’t take us long to spot and identify lizard, rabbit, kangaroo rat, sidewinder and beetle tracks. And we couldn’t figure out some of them but knew that a critter had made it. I never would have guessed that these were beetle tracks. 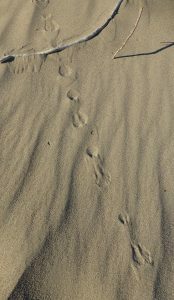 We headed onward to explore the dunes. 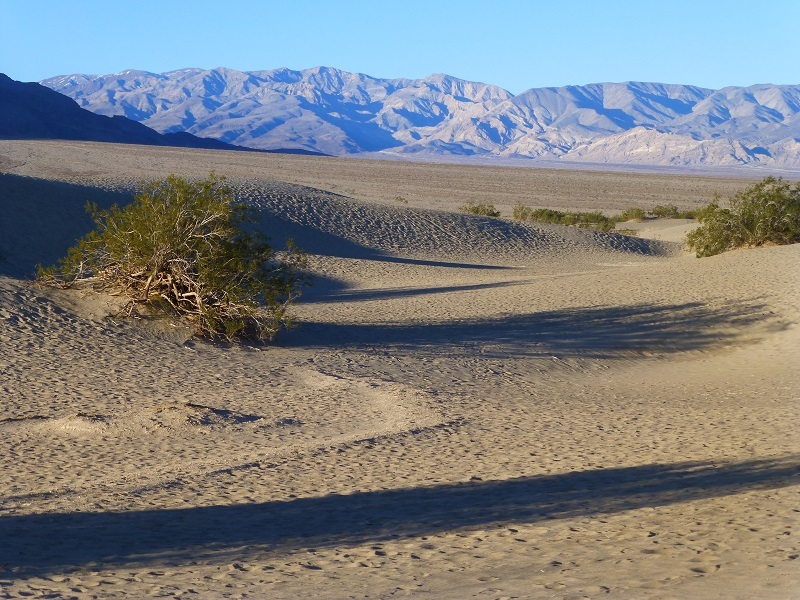 The views in every direction were amazing, with the early morning shadows creating a calming feeling. 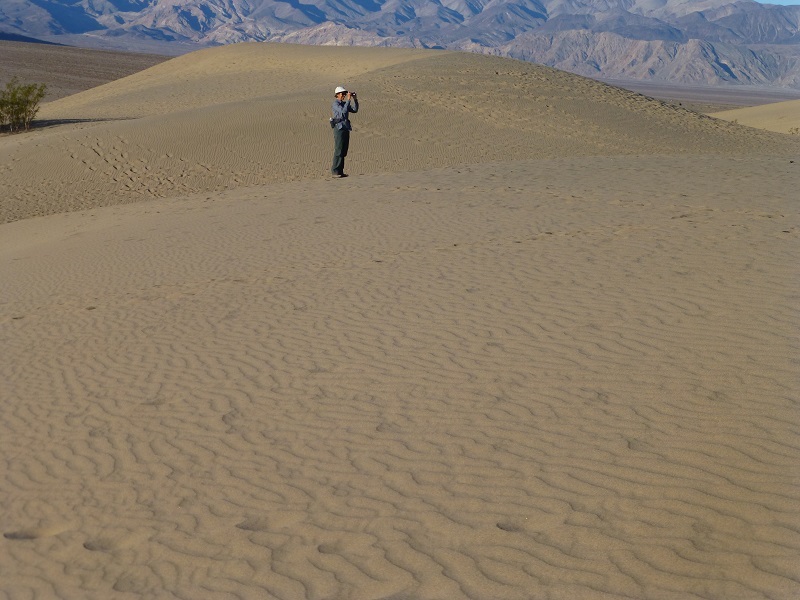 Lighter colored hardened mud was in the bottom of some of the dune valleys. These are the remains of the old lake bed that these sand dunes have accumulated on top of. 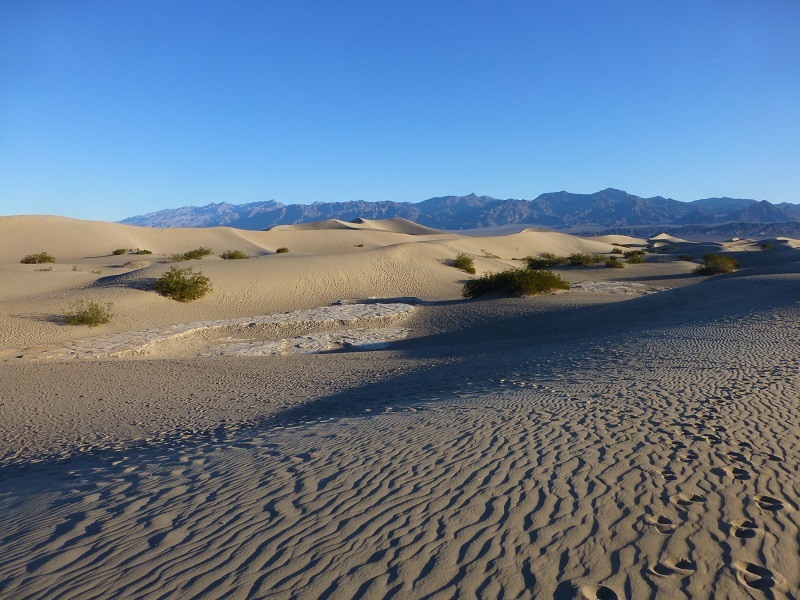 The shapes of the dunes, contrasted with the blue sky and mountains looked different as we approached them from different directions. 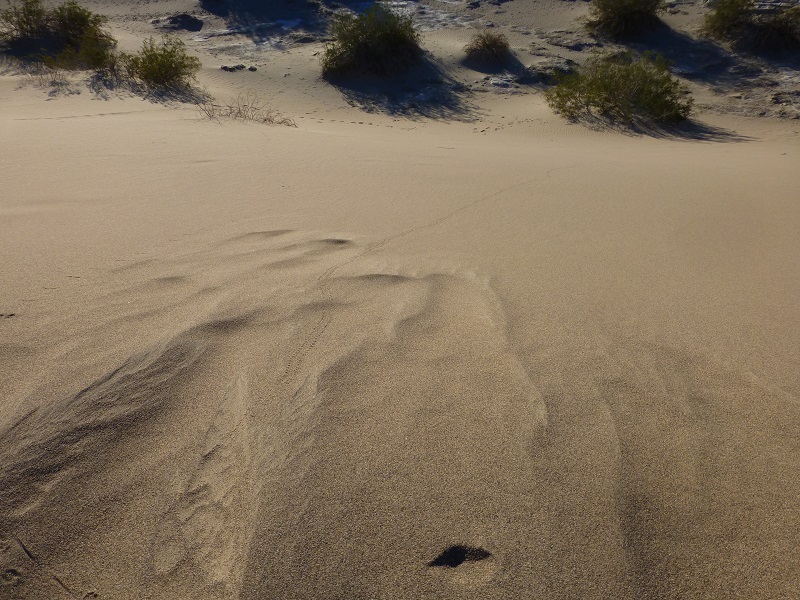 Once we got in the middle of the dunes, we could appreciate that they some of them rose almost 100 feet above the old Mesquite Lake. 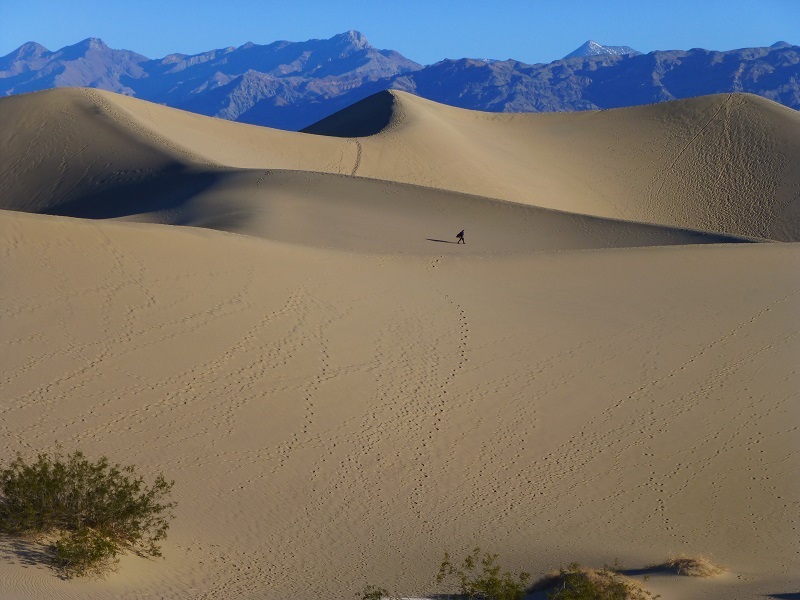 You don’t appreciate the size of these dunes until you see a person in them. 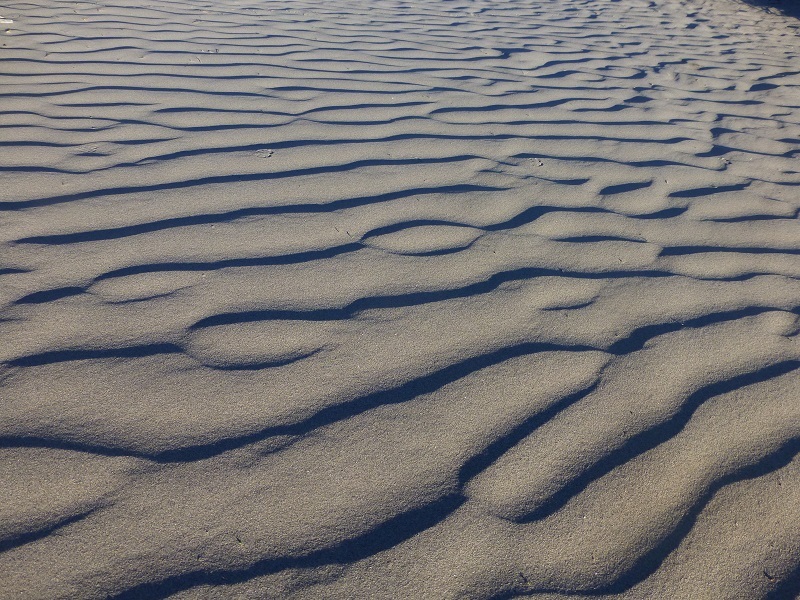 When we looked closer, we discovered wind blown sand had created many beautiful patterns. 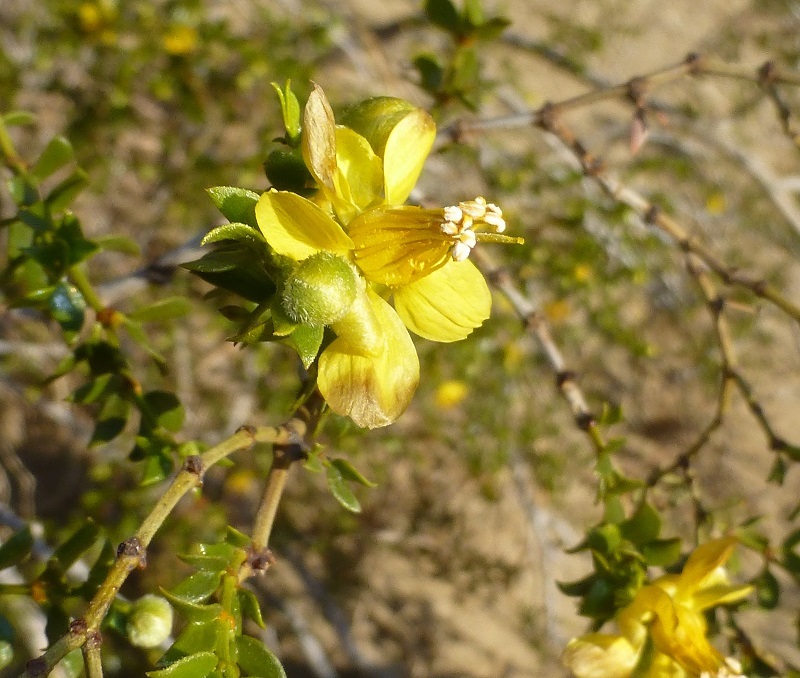 The only flower that we spotted on this trip was on a creasote bush, also known as greasewood. Larrea tridentata is referred to as chaparral when it is referred to in its medicinal or herbal context. 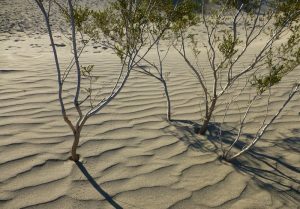 Native Americans have used this plant for several different uses but The United States Food and Drug Administration has issued warnings about the health hazards of ingesting chaparral or using it as an internal medicine, and discourages its use. 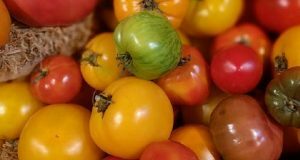 In 2005, Health Canada issued a warning to consumers to avoid using the leaves of Larrea species because of the risk of damage to the liver and kidneys. 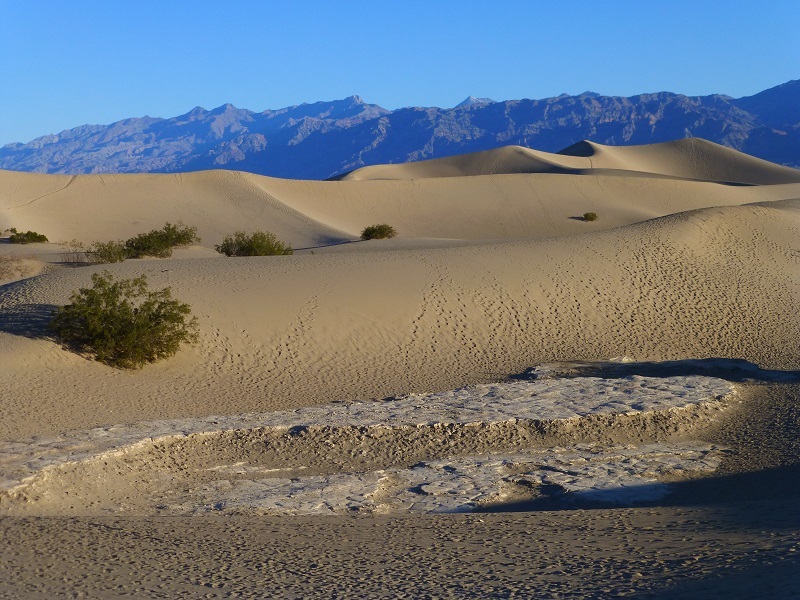 We had cooler weather on this trip but if you visit the Mesquite Dunes, or any of Death Valley, it can get very hot and windy. 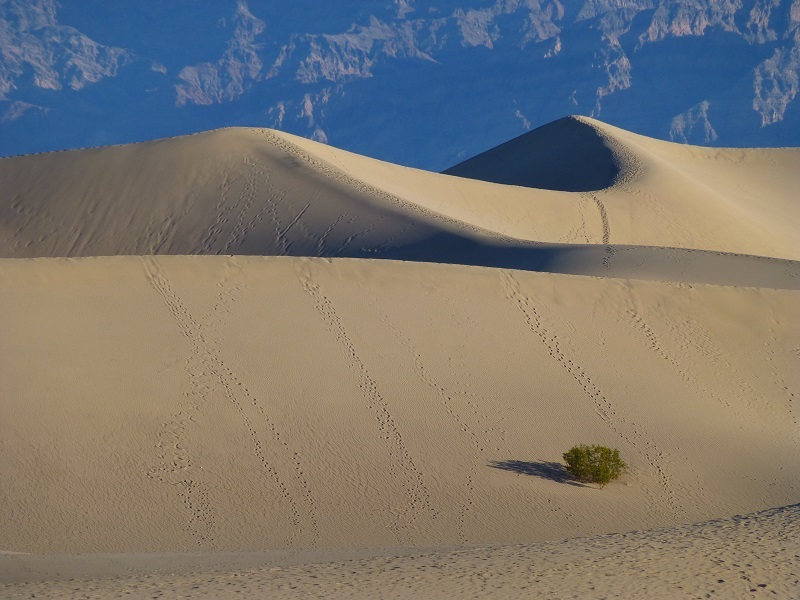 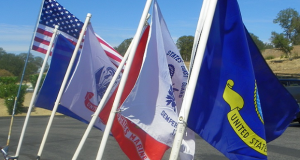 Make sure you are prepared by dressing appropriately, bringing plenty of water. 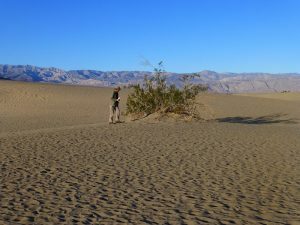 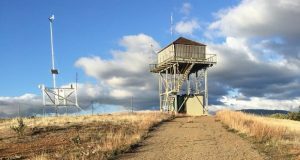 We also lucked out that the wind wasn’t blowing because if it is, the area can just be a dusty, sand blasting kind of experience.